MizzouFirst, I would like to introduce myself. I’m a senior convergence/photo journalism major at Mizzou, in my last semester of coursework. I just started playing Pokémon again this Battle Roads season after getting back into the game, thanks to an addition to Pokémon TCGO. This is my first competitive season, playing the game in what could be a non-competitive form up through the first Neo set. Around City Championships, I finally got a collection large enough to be able to field some competitive decks. I currently stand at an unimpressive eight Championship Points in the Masters division, and my goal for the rest of the season is to finish around 20 Championship Points, and more consistently top cut the events I play in from here on out. I won’t be able to go to Spring Regionals, but I will have more time to test after I graduate (40 hours of work a week, plus 15 credits of school really puts some time constraints on you), so I’m expecting to have a good Spring Battle Roads season and a good showing at Nationals, and hopefully a good third weekend at Missouri states. The deck I decided to go with for State Championships was Celebi/Mewtwo, since it has been the deck I have been playing with the most since the release of Next Destinies. The deck has solid matchups across the board, and I felt the ability to get some easy donks would help over the course of a bigger tournament. Before I get into my report for this past weekend of States, I’m going to go over my unsuccessful first weekend of States, as that first weekend influenced a lot of changes in my deck which made it stronger for the second weekend. PokeGymI had a really bad tournament with this deck, starting the tournament 0-3, and finishing at 3-3. I lost in the first round to Typhlosion Prime/Reshiram BLW/Mewtwo EX because I had both of my Regigigas EX prized. I lost to Zekrom/Eelektrik in round 2, not drawing a Supporter in seven turns, and having the Double Colorless Energy knocked off my Regigigas EX that was ready to go on an early killing spree because of a Crushing Hammer. The problem I had with my deck the first week of states in Nebraska was that my deck wasn’t consistent enough, so it didn’t always setup as I would like. With that in mind, I made quite a few changes to my deck list to make it run more consistent, and give it more of a threat for the donk. Now, to explain the list. Celebi Prime – I chose to only run three Celebi Prime instead of the standard four Celebi Prime in my list for this past weekend. After the first turn, I found that Celebi Prime was too much of a dead card after the early game, and I never needed more than two in any matchup. Running three Celebi Prime out of nine total Basics gave me a 45 percent chance of starting with Celebi, compared to 54 percent chance if I ran four Celebi Prime with ten basics. I found that giving up 0-1 games of starting Celebi over the course of Swiss was worth it for fitting something else in my list. 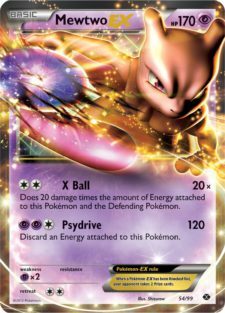 Mewtwo EX – Three Mewtwo EX is the needed play in this deck. It allows you to take any Mewtwo war until the final prize card. Regigigas EX – This is my preferred early attacker in this deck. The card can attack for 80 damage with a good turn one, and it’s difficult for any of the other EXs to ohko it. 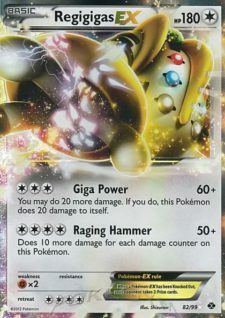 Once on the field, Regigigas poses a problem for your opponent, as if they put any significant damage on Regigigas, it can start getting OHKOs with Raging Hammer. Most importantly, it puts the Typhlosion/Reshiram matchup, an otherwise tough matchup, into near auto win territory. Against that deck, you can take out Cyndaquils and Quilavas with Regigigas’ first attack, Giga Power, and then if they ever attack into you with Blue Flare, you are able to take out any Typhlosion Prime that they setup with Raging Hammer. If they stack energy on a Mewtwo EX to take out Regigigas, you can get the easy revenge ko with your own Mewtwo. 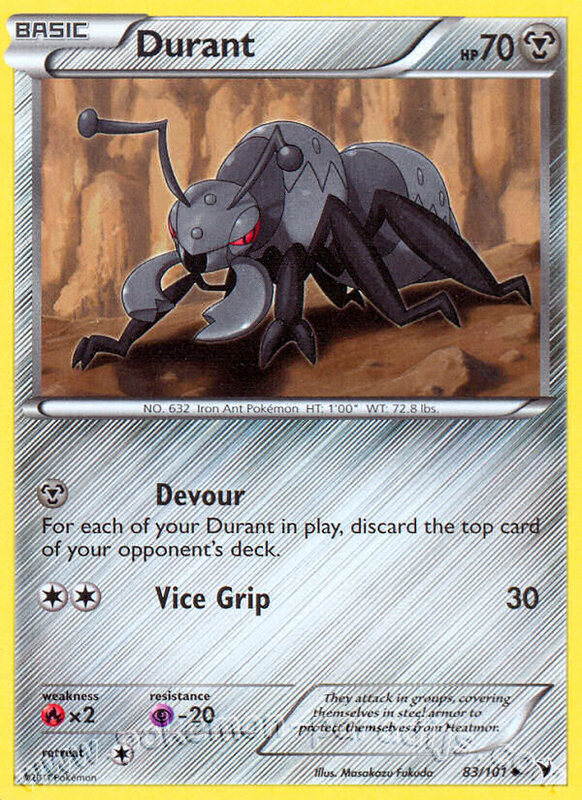 Pinsir – This was my tech for Quad Terrakion NVI. The idea behind the tech is that Quad Terrakion doesn’t have any energy acceleration, so you can use Pinsir’s first attack, Power Pinch, to run the deck dry of energy. Once their Terrakion has zero energy, you go for the knock out, denying the effectiveness of Exp. Share. 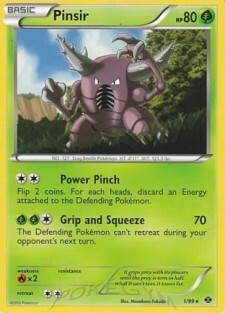 You can generally just do this with Pinsir himself, as his second attack, Grip and Squeeze, OHKOs Terrakion. If you get a good enough setup, you can even just donk Terrakion with Pinsir. Supporters – I decided to go with 12 Supporters this week and only 1 Pokégear, compared to 10 Supporters and 3 Pokégears in my deck from last week. What I found is that having the actual Supporter, instead of the chance for the Supporter with Pokégear was a lot more consistent. 4 Professor Juniper and 4 Professor Oak’s New Theory is pretty standard for this deck; the only thing I did that isn’t quite as popular, but not unheard of, is max out N. N is really good once the Mewtwo war begins, as players start getting down to 4 and then 2 prize cards really fast. Being able to N your opponent into a bad hand is crucial to winning the Mewtwo war consistently. Energy Retrieval – I took out the Revive in my list from last week in favor of an Energy Retrieval. Revive was useless for me the first week of States, and it’s not really hard to see why. When you run five EX attackers, by the time you would need the revive, you would have already lost the game. The Energy Retrieval on the other hand is a lot more useful, as it allows you to be more aggressive with getting rid of a lot of energy early with Professor Juniper, and can get you out of an energy pinch in the late game. Energy – I went with a high energy count, with 11 Grass Energy and 4 Double Colorless Energy. What I found in week one was that I wasn’t hitting my energy consistently enough to get the donk or a good early game, so running more energy helped a lot in getting this deck off to a good start. We had somewhere around 100 Masters at the start of the tournament, which meant we would get seven rounds of Swiss and a top 16 cut. Going into the tournament, I knew that going 6-1 would get me into top cut for sure, and going 5-2 would give me a very strong chance at making the cut. As far as I could tell, he was running the version of the deck that ran only Mewtwo EX, as I didn’t see anything else hit the field or discard besides that. 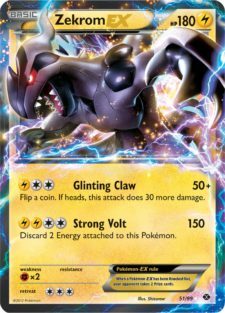 Unsurprisingly, the game came down to an intense Mewtwo war, with me prevailing as I was able to stick him with some bad hands with N.
This is a bit of a rogue deck that I was actually prepared for, running into one on PTCGO a few days ago. 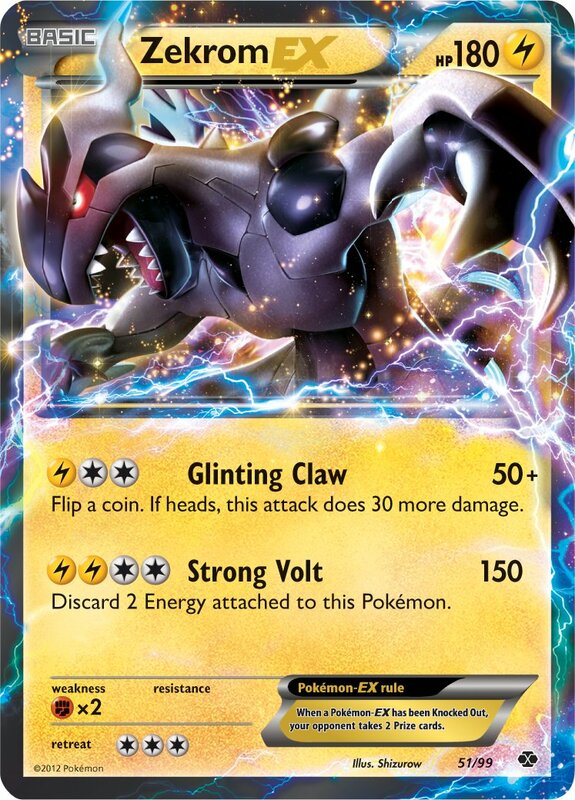 The idea behind the deck is to consistently stream 150 damage Strong Volt’s with Zekrom EX, by using Vanilluxe’s Slippery Soles Ability to return Zekrom EX to the bench every turn to be recharged. Unfortunately I drew dead the entire game, not hitting a Supporter or Energy until my final turn of the game. That’s just the way the game goes sometimes. I ended up facing our PTO for mid-Missouri in this game. I knew that he had played Celebi/Mewtwo the week before, but wasn’t sure if he stuck with it for a second week I won the coin flip, with a Celebi and Regigigas start to his lone Celebi start. I was able to get the three energy on the Regigigas and the Skyarrow off of a PONT for the donk. Don’t remember too much about this game, other than that I took out his Eelektrik’s with Regigigas EX to cut off his energy acceleration. The game ultimately ended up going into a Mewtwo war, which I won thanks to being able to N him into a bad hand in the late game. I started with Celebi and Regigigas to his lone Rotom UD start. I used a Professor Juniper right off the bat to go forthe donk, but missed it. He is able to Collector on turn one, and begins devouring. He uses a Juniper, and lands into pretty much all of his Eviolites, getting Eviolites on all of his Durants, which makes the matchup more difficult. I went for the Catcher knock outs on his Rotom (which he kept Reviving early), as he had a Durant prized, and also because he ran black belt and four prism energy, making the threat of a Plasma Arrow knockout on my Regigigas EX very real. I only ended up putting 40 damage on my Regigigas EX before attaching an Eviolite to it, as he would probably would have been able to get the knockout on it (and thus losing me the game) if I went up to 60 damage on it. Ultimately, I ended up only being able to hit his Durant’s with Special Metal and Eviolite for 60 on a bunch of turns, which led to me losing to the deck by a single card. It’s frustrating to lose to Durant by a single card, as there are so many small moves made throughout the course of the game that could have changed the outcome, but oh well, he played a really good game and deserved the win. After this game, I have re-evaluated how to approach the Durant matchup. While I liked the potential of Regigigas EX, if more players start going with the more aggressive Rotom threat with 4 Prism Energy, Regigigas EX is a bit of a liability, as it can be Black Belt/Plasma Arrow’d for the knockout if I put the 60 damage on it to assure the OHKO on Durant with Raging Hammer. If I do start with Regigigas again, I pretty much have to go with it as my attacker, because of its four retreat cost. With a Regigigas start, I have to have only three energy on it when I go up to 60 self damage on it to avoid the potential Plasma Arrow knockout. This is a bit of a liability against Durant as Lost Remover/Crushing Hammer can really set you back if you don’t have energy stacked on your Pokémon. Going forward, I think I prefer Mewtwo EX as my attacker in the matchup, as you can drop the Eviolite on it right away, which you can’t do with Regigigas EX. You can put six energy on Mewtwo without it being threatened for the Plasma Arrow knockout (seven with Eviolite), and you only need five energy to ensure the knockout on a Durant with energy on it. I was able to build an early prize lead with Mewtwo EX, as Mewtwo does a pretty good job of knocking out Oddishes and Phanpys in the early game. I made sure to get rid of the Aipom early, as I couldn’t afford to have my energy constantly moved to a Celebi. I ended up in a bit of a tough spot after he dropped a Cobalion, which I fell 10 damage short of knocking out with X Ball. Coming to save the day was none other than Pinsir. I dropped my Pinsir onto the bench, attached a double colorless energy, retreated to Pinsir (getting rid of the DCE on Mewtwo, so I could attack Scizor with it), used Power Pinch, and hit double heads to knock two energy off of Coballion and essentially nullify it as an attacker, leaving him with a field with only one energy on it. He retreated to Donphan to buy time while he attached energy to his benched attackers. I just left Pinsir active while I powered up two Mewtwo EX to get ready to take my last two prizes, knowing that the Donphan wasn’t leaving the active spot until I knocked it out. 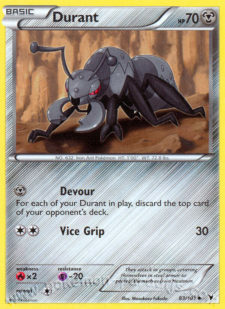 He was eventually able to knock out Pinsir with Earthquake (while also taking out his benched Coballion with 110 damage). From there, I used Forest Breath to attach a Grass to a Mewtwo EX, attached DCE to knock out Donphan for my final prize. There isn’t too much to say about this game. I started off fairly bad, opening with a lone Mewtwo EX. I took what prizes I could with it, as I knew the thing was going to die fairly early anyhow. The one move I made that probably won me this game, was not playing down multiple Skyarrows, as they would have helped him more than they would have helped me. The game fell into a Mewtwo war, which I once again won because I was able to N my opponent to a bad hand, taking my last four prizes in consecutive turns with a Mewtwo EX, knocking out two straight Mewtwo EX. I ended Swiss play with a 5-2 record and was pretty confident that I would make cut, as most of my opponents had finished either 6-1 or 5-2 themselves, and I believe no worse than 4-3, so my opponent’s win percentage was one of the higher ones in the tournament. I ended up making the top 16 cut as the #9 seed. This was probably the hardest tournament I played in so far. My opponents in Swiss ended up finishing ranked at 19, 14, 34, 20, 9, 30, and 25, so I was playing some tough competition throughout the day. This helped a ton in getting me into top cut, as I ended with what I think was the 4th highest opponent’s win percentage in the tournament, allowing me to safely get into top cut at 5-2 instead of bubbling out like a lot of players. My opponent was a relatively new player, just like myself. He started playing during the Battle Roads season, like me, and has just recently got the cards to be real competitive at tournaments, just like myself. He was playing Zekrom/Eelektrik, which is a matchup that I’m fairly comfortable at this point, so I felt pretty comfortable. In game one, he setup his board really fast, getting a Zekrom EX going early which I didn’t really have the resources to keep up with. I sent a Mewtwo EX to the discard pile early, to avoid having it vulnerable on my bench, not realizing that I had a Mewtwo EX prized, which led to me only having one for the entire game. I was able to take out one of his Eelektrik’s with Regigigas EX, but whiffed on a Junk Arm or PlusPower to take out the second, only being able to do 80 damage to it. I think his third Eelektrik was prized, since he didn’t go for more Tynamos, so if I were able to take out that Eelektrik, I was pretty confident that I had taken out his energy acceleration for the game. If I had been able to take out the Eelektrik, the plan was to send all his energy to the discard pile with Pinsir, and then to try knocking out his attackers with Pinsir to get my last Regigigas EX or Mewtwo EX out of my prize cards. However, whiffing on the PlusPower gave him energy acceleration, and he was able to narrow my field down to just Celebis, so I scooped. In game two, I got off to a much faster start, and was able to take out two Eelektrik early in the game. I hit a PlusPower, allowing me to Raging Hammer for 200, minus 20 for Eviolite, to take out his Zekrom EX, and then I was able to take out his Mewtwo with my own Mewtwo for the win. In game 3, he once again got setup way too fast for me to take out all his energy acceleration, and I think he ended up winning 6-3 on prizes. Knocked out in the top 16. While I would generally give the slight edge to Celebi/Mewtwo in this matchup, I think the way his deck was constructed gave him around a 65/35 advantage in the matchup. What his deck build did that gave my deck a lot of trouble was that he ran at least 3 Smeargle UD. Since my deck runs 12 Supporters, he was able to consistently get setup on turn 2, getting some really good Portraits with Smeargle. All in all, it was a good tournament. I finished tenth in the standings, and I felt my deck performed like it should have, which I didn’t feel was the case in Nebraska. My opponent in top cut was a really cool guy, so I hope him continued success as he continues to grow as a player. Before I finish, I am going to give one more deck list for this deck. This is the list I would run if I were to play this deck again next week at Missouri states. Not a whole lot of changes for this deck. I took out the Pokégear 3. for a Smeargle. 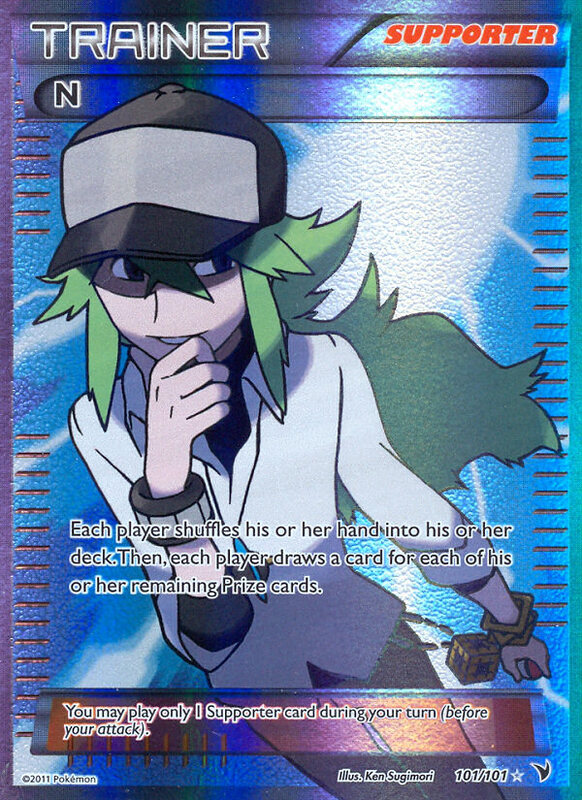 The Pokégear was the only card in my deck that was useless for me the entire day of the tournament. Smeargle is a card that I heavily underrated going into this format, and after seeing it used against me to such effectiveness, I decided to give it a try in this deck. In early testing, I am really liking the inclusion of Smeargle in this deck. It allows you to more consistently get a good setup, and it increases your likelihood of getting the donk, as you can go through more of your deck on the first turn in trying to get together all of the pieces for the donk. It also helps in those odd games where you completely dead draw, giving you a potential out in those games. The one thing that this format is going to be remembered for is the epic Mewtwo wars that the majority of games between top decks comes down to. Once the Mewtwo war starts, the goal is to eliminate your opponent’s Mewtwo EXs while trying to force your opponent into missing the revenge KO with their own Mewtwo. Throughout play testing as well as my games in tournament, I have found that the Mewtwo war comes down to four crucial elements. Mewtwo EX – The first is Mewtwo EX. Running three Mewtwo EX is essential to consistently winning the Mewtwo war. Running three Mewtwo allows you to consistently take the Mewtwo war down to the final prize card. If you don’t have that extra Mewtwo to revenge your opponent’s Mewtwo, they can usually take the last two prizes with their Mewtwo before you can with other attackers. PlusPower – This card allows you to take out your opponent’s Mewtwo EX with two energy on it, with your own Mewtwo EX with only two energy on it, creating the potential for them to not get the revenge KO on your Mewtwo. 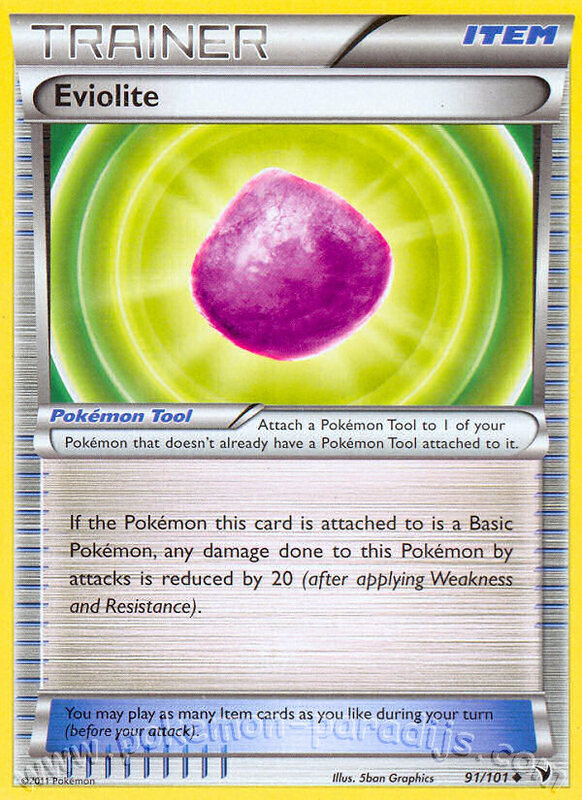 Eviolite – This card prevents your opponent from getting the revenge KO on your Mewtwo EX with two energy and a PlusPower. 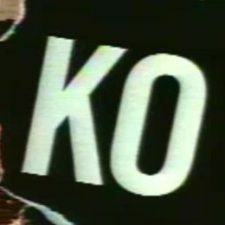 If they want the revenge KO, they are forced to put three energy on their Mewtwo EX to get the revenge KO, making their Mewtwo EX vulnerable to a revenge KO from your Mewtwo EX with two energy on it. 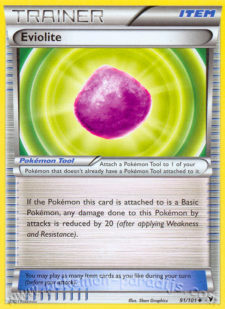 N – This card is what won me all of my Mewtwo wars. In so many of my matchups, I fell behind in prizes, only to make a comeback once the game entered the Mewtwo war phase, by taking multiple prizes with my Mewtwo EX. Once the EXs start flying around, your opponent gets down to four or two prize cards fast, and N’ing them down to 1-2 cards in the late game usually is enough to prevent them the resources to get the revenge KO on your Mewtwo EX with two energy on it. As far as Missouri states, I am a little unsure of what deck to run. I feel like I have a strong Celebi/Mewtwo build, but I also feel that a lot of other players do too, making it a tough tournament to run through with the deck. With the top decks of the meta pretty much established as Celebi/Mewtwo, Zekrom/Eelektrik, Durant, Landorus/Terrakion, and Troll, with lesser tier decks of Typhlosion/Reshiram, Vanilluxe, and Donphan and Dragons having some success, I think the time is ripe to work on a good rogue to counter the meta. Since this is the last tournament I will be able to play in this format, it would be nice to play something else for this next tournament too. If anyone is interested in contacting me, you can hit me up on the SixPrizes message board (Charranitar), on HeyTrainer (Russian Charizard), or on Twitter (@WambyBambi). Shoulda run that prism for the Vanilluxe matchup. Sweep with Celebi. Ya boi. Talk about a boring match up. 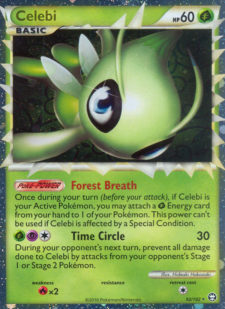 Celebi only prevents damage, so you would do 30 then be paralyzed the rest of the game. Let’s count how many 6p Front Page Writers made Top 16 and lost Round 1. There were multiple points in the game where I could have played down a Skyarrow Bridge from my hand onto the field, and chose to discard it with Juniper or shuffle it back into my deck with PONT instead of playing it, as I felt it would give the spark my opponent needed to get his deck rolling. Nice article. This looks like an interesting take on the deck. Personally I think I’ll probably stick with Tornadus as Gigas just seems like a big fat liability. That said, I love the guy, so I’m at least going to test this version out! Okay, I was wondering what you meant! And yeah, holding that Skyarrow can sometimes be a very good idea. I tought it was pretty wird not to see a smeargle in any of your lists, considering you were complaining about consistency. There is no card that boosts consistency in this format as much as smeargle does, i think not even magnezone, since he´s a stage 2 vs a basic. Check my last list at the end of the article. I put a Smeargle in there. I heavily underrated the card going into the format, but lost in top cut because of how much Smeargle help my opponent set up, while I didn’t have that same component in my deck to help me set up super fast. 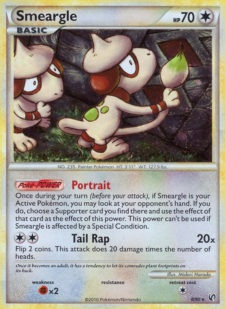 Smeargle is definitely good in this deck. Hey. This is Eli Shotkoski, the person who ran the “bad Cubone TM/Regigigas ‘rogue.’ ” I’d just like to say that calling another person’s deck out as a bad deck is one of the least sportsmanlike things one can do. Yes, I found this article and I’d also like to say that you seem very focused on winning. The reason I ran my deck is because I like it and find it very fun to play. Winning matters least to me. I placed 36th out of 38 here in Nebraska and I don’t care. It was my first major tournament and I had fun. That’s all that matters to me. Sure, the notoriety and prizes which come with many wins is a nice thing, but it can also corrupt an individual. However, I am glad to see that you are enjoying yourself and wish you luck on the rest of your travels on to your way to Nationals and maybe Worlds. I accidentally double comment so whoops. I hope you can understand that the purpose of this article is to help other players with a more competitive level of play, and I feel in doing that, it’s important to be objective about what’s good/bad as far as decks go that can compete in the meta game so players don’t get misconceptions about what can work at a competitive level, and then show up to an event only to be disappointed when they don’t do well with a deck. And I’ll say that you were a good opponent to play. I apologize for any disrespect from that line in the article, and hope you continue playing and have fun playing the game. I thank you for the apology, and I accept it fully. I dont think eviolite helps mewtwo at all in the mewtwo war. 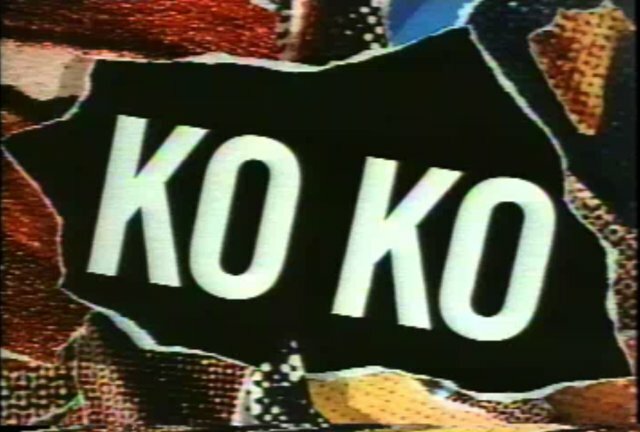 because it’s either it OHKOs it or it doesnt in which case they wont send out mewtwo. Also actually a mewtwo with 2 energies and a pluspower will still ohko a mewtwo with 2 energies (2+2 plus power = 100 which means it hits for 200 on a mewtwo with eviolite thus OHKOing it.) Also Im wondering why there’s no tornadus? it really helps in the durant match up more so than mewtwo being your only attacker. Or in other words, your Mewtwo lives.